Here at Plant Therapy, we are committed to making sure you have the information you need to safely and effectively use all of your essential oils. 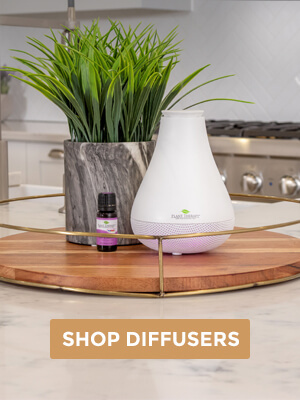 Due to the volatile and highly concentrated nature of essential oils, comprehensive and understandable guidelines on their appropriate dilution is critical to ensure everyone’s safety. First, let’s discuss the purpose of dilution. Simply put, we dilute essential oils before applying to the skin to minimize adverse reactions and systemic toxicity. Applying undiluted essential oils to your skin can easily cause short term or long term adverse reactions, and there is no good reason to take the risk. Diluting not only saves your skin, but your bank account will appreciate it, too. 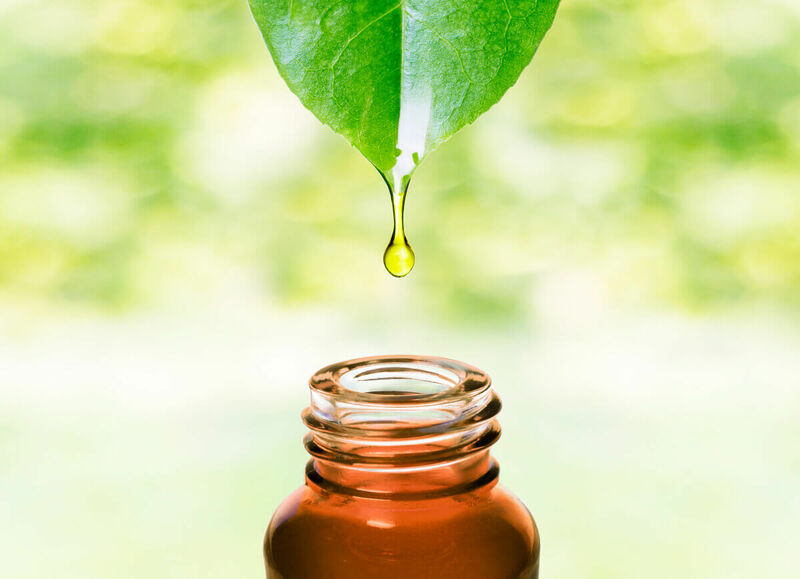 Diluting with a carrier oil before applying to your skin prevents the essential oil from evaporating as fast as it would if not used with a carrier oil. This reduction in volatility means that more of the essential oil’s therapeutic properties are able to absorb into your skin, it can be spread over a larger area, and you will use less essential oil overall. There are many different types of carriers for your essential oils. 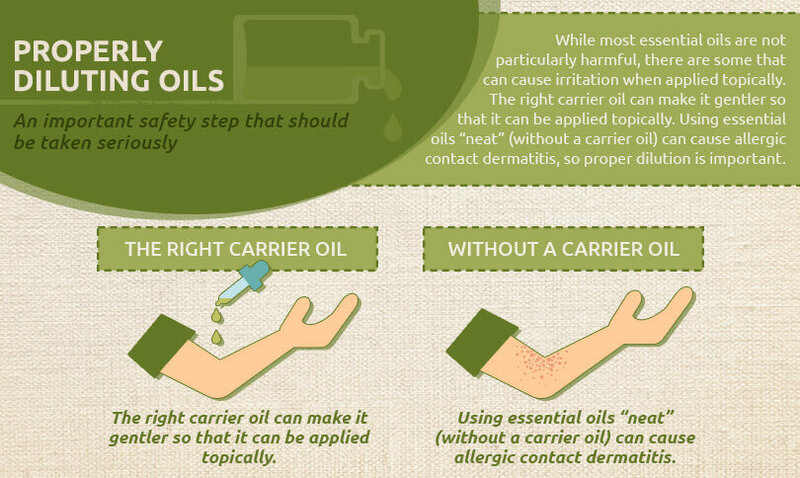 While carrier oils seem like the obvious choice for carrying essential oils, they are not your only option. Lotions, creams, butters, shampoos, conditioners, castile soap, and aloe jellies are fantastic choices to dilute your oils, and many of these products may include natural preservatives, which may suit your needs. Now let’s learn the correct dilution rate for your situation. This rate is recommended for children over the age of 2, facial applications, long term use, daily use, and accessing the subtle energetic effects of the oil. This rate is recommended for children, bath and whole body products, and is great for regular daily use of an oil. Many of our KidSafe blends have dilution recommendations that range from 2-5%. These dilutions are fine to use with children under the age of 10 for spot treatment or acute situations. We do always recommend starting on the low end of dilution recommendations and then working your way up as needed. This rate is recommended for specific localized discomfort. This rate is recommended for short term use for a specific concern, no longer than two weeks. This rate is recommended for small areas of concern and acute situations. Use this chart to help you calculate various dilutions. Take extra caution when diluting for young children. Children have thin, porous skin that readily absorbs anything topically applied. We do not recommend essential oils be used topically on premature infants, but the dilution for full term infants, ages 0-3 months, is 0.10% to 0.20%. This equals 1-2 drops of essential oil per 1 ounce of carrier when being used for whole body application. For spot usage, you can use 3-9 drops of essential oil per 1 ounce of carrier. Additionally, we recommend that anyone wanting to use essential oils on children under the age of two years consult with a Certified Aromatherapist or medical professional to help you decide if this is the safest and most effective course of action. For children ages 3-24 months, we recommend a general dilution of 0.25%-0.5%. This equals 2-4 drops of essential oil per 1 ounce of carrier when being used for whole body application. For spot usage, you can use 9-27 drops of essential oil per 1 ounce carrier. For children ages 2-6 years, we recommend a general dilution of 1%-2%. This equals 9-18 drops of essential oil per 1 ounce of carrier when being used for whole body application. For spot usage, you can use 9-45 drops of essential oil per 1 ounce of carrier. Use this chart to help you calculate various dilutions, specifically for children. 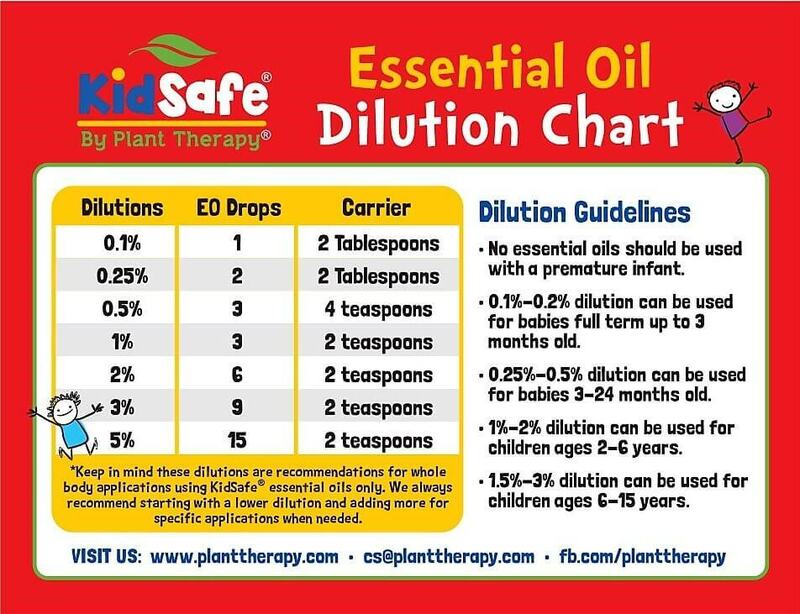 The dilutions recommended on this chart are for whole body applications using our KidSafe essential oils and blends only. For both adults and children we recommend starting with a lower dilution and adding more for specific applications when needed. If you still want to use an undiluted essential oil topically, please get advice from a Certified Aromatherapist first. There are some specific situations where you can use oils neat, however, err on the side of caution. A sudden burn after touching a hot pan or a stinging bug bite are both examples of acute, short-term issues where using an oil neat may be beneficial. If this is the case, receive professional guidance on safe usage. Not only can some essential oils irritate the skin, but you will increase your risk for sensitization. Please note that we always urge safe, conservative use of essential oils so that you can continue to reap the benefits of these wonderful tools without creating additional problems. If you are on a course of treatment with prescribed medication, have epilepsy or asthma, have a compromised immune system, are pregnant, breastfeeding, or have any doubts about how an essential oil may negatively affect your health, seek advice from your physician. When it comes to essential oils, the saying “I’d rather be safe than sorry” should be taken seriously. Applying essential oils directly to your skin without proper dilution increases the risk of adverse reactions significantly. Keeping safe use of essential oils in mind, always use the lowest dilution possible that gives you effective results. If you are concerned about a negative reaction to a new essential oil, we recommend conducting a patch test. For first time use of an essential oil, a safe practice is to place a drop of diluted essential oil to a small area of skin, such as the inside elbow. After application, be aware of adverse reactions for the first 24 hours. Possible reactions include skin irritation, headache, nausea, respiratory complaints, or dizziness. **The advice shared is not intended to diagnose, treat, cure, or prevent any illness or disease nor is it intended to replace proper medical advice. When using essential oils we always recommend you consult with your doctor. This is a great post with tons of helpful information. The charts are especially helpful! I’m so happy to see this information here, plainly written for all to see! I see so many people with affiliations to mlms providing and recommending unsafe dilutions and practises. I’m happy plant therapy cares about its customer base so much! Very useful post! I am trying to make roller ball with Tea Tree for my daughter’s acne and this made it simple to figure out the right dilution. Although since most of my containers are in ml I do prefer measurements in that rather than oz . . . even though the math is simple I tend to make simple mistakes lol! This is the same question someone else asked but they didn’t get a response… is the dilution guide for each essential oil added or for the total drops of essential oil added regardless of variety? Example: for a 0.5% dilution I would add 3 drops to 4 tsp. of carrier oil. If I wanted peppermint and rosemary, would I add three drops of each to that 4 tsp. or 3 drops total – splitting the 3 drops between the two essential oils..? Laura, the dilution recommendations are for *total* drops added for all oils in your blend. So if you wanted a Peppermint/Rosemary blend at a 0.5% dilution, you would split the 3 drops between the two essential oils. The easier way to do this would be to change your amount of carrier rather than try to get 1.5 drops of each oil, since half a drop can be a bit tricky to determine. For instance, if you did 3 tsp of carrier oil, a 0.5% dilution would be 2 drops, allowing you to do an easy one drop of each Peppermint and Rosemary 🙂 I hope this helps! Thanks for the tips. I am fairly new to EO’s I have been trying to make roller blends with 10mls and 2mls rollers. So how does the dilution ratio change when you use several types of oils? If your trying to get 1% in a 10 ml roll on is that 6 drops of each oil or 6 total? If it is 6 drops total doesn’t that make the percentage of each individual oil less than 1%? Thanks for the help. In a 10 mL roll on bottle, you would only need 3 drops *total*. 6 total drops would equal a 2% dilution. Also, yes, if you stick with the total number of drops for a certain percentage, each oil would be less than 1%. If you would like a higher overall percentage, you could go up to 3%, which would be 9 total drops, making the amount of each EO you use a bit higher. I hope this helps! Sorry I didn’t get it. I have lavender and tree tea essential oils, how can i make 3 percent dilution?? And can we use it on body? Dichhya, yes you absolutely can use Lavender and Tea Tree on the body! A 3% dilution would be 13 total drops in a tablespoon of carrier oil or lotion. Or, you could make a larger batch and do an ounce of carrier or lotion with a total of 27 drops. Hope this helps! Sorry i didn’t get it . I have lavender and tree tea essential oils , how can i make 3 percent dilution?? Pris, I’d hate to recommend throwing anything out! Is there a way you can add more carrier oil? Maybe transfer your mixture to a larger bottle and fill it with more carrier? My largest concern here would be the Lemon, as that’s a phototoxic oil and shouldn’t be diluted to higher than 2% for some serious safety concerns. Although Lavender and Peppermint pose less of a risk being at a high dilution, there is a big difference between them being anywhere from 5% to 10%. A dilution like that would be OK for short-term, acute use for a specific issue, but not daily. Are dilution percentages for each single oil you use, or would you make your blend first and then determine the dilution percentage for the whole blend? Ada, if you are making a blend of essential oils, the entire blend should have a dilution percentage around 2 or 3%, ideally (but of course this depends on what you designing your blend for). You could also make your blend first, keep track of the amount of all the oils you have included, then add enough carrier oil to get the end dilution you are looking for. I hope this helps! This is confusing to me. If there are 20 drops in 1 ml, there would be 200 drops in 10 ml. Therefore, I would think that a 2% solution would be .02 X 200 which equals 4 drops, not 6. And a 3% solution would be .03 X 200 which equals 6 drops, not 9. Am I wrong on this? Thanks! I have been as equally nervous as other users on this topic and grateful for all PT staff’s patient answers. I wonder if PT can one day create an online dilution calculator for all sorts of purpose? That’ would be a gospel for all users! Thank you for this post. I love all that I am learning about EO, and that you give handy little guides to help. So if you want to make a roller for severe nausea what is the highest dilution for an adult when it will only be used for a couple of days? Thank you for this article. It’s a great reference especially for those of us that are still new to EOs. Great information…not only for newbies but as a reminder for all. This information was incredibly helpful! I especially appreciate the chart and clear explanations of teapoons, tablespoons, and oz per number of drops. Great tips and clear instruction on how to safely use oils! 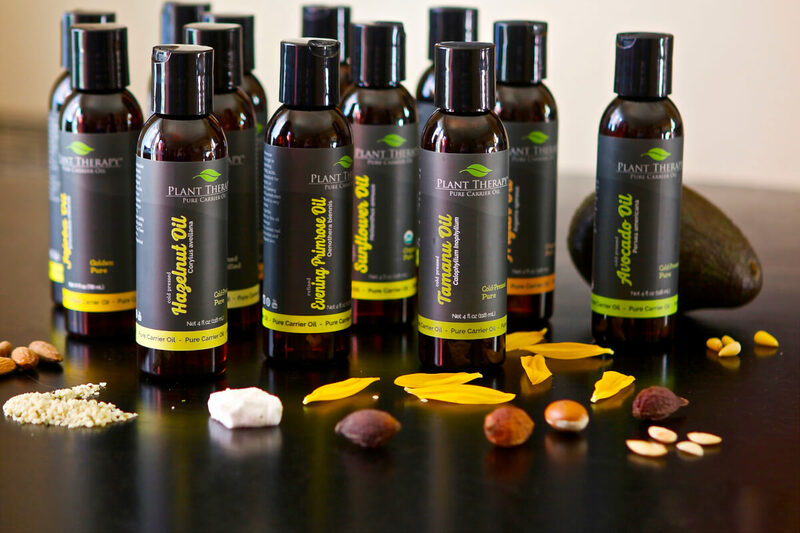 I love learning more about how oils used correctly are a great addition to any wellness routine. Thank you for the information and chart. I’m new to EO and am thankful for the guidance I can find here. According to the info in this article, facial applications should be diluted at 1%. 1% dilution with 30 ml carrier oil uses 9 drops essential oils. So with your 25 ml carrier oil, it would be best to use 1 drop of each of your 6 oils, then 1 or 2 drops of the lavender that you are wanting to add extra, for a total of 7 to 8 drops of essential oils to 25 ml carrier oil. So grateful for this information. Used to purchase from MLM company, and they didn’t provide much education. I’m a Plant Therapy fan for life. I haven’t purchased any of your oils yet, but your safety standards are making me want to! I love that you focus so much on safety, especially with the kiddos! So my question is, is dilution for the face the same as dilution for the undereye area? I was thinking of making an undereye roller. Thank you!!! I’m so glad you told me this, thank you!!! Thank you! This has been so helpful! I’ve always been unclear about the dilution guidelines but this article explains everything so well! Thank you for the detailed explanation on how to properly dilute EO’s. Even after almost 2 years if using it, I still tend to get confused. I will print this for easy access in case I forgot again lol! Love this! Thanks so much for keeping us safe! This post is very helpful. There are many recipes out there, so it is good to have a definitive guide for safety. I feel more comfortable in making blends as a result of having a chart like this. Also, it’s good to have one place to refer back to as I sometimes forget how many ml = how many drops or how many tsps are in an ounce or vice versa, etc. Good job, Plant Therapy! This is so so useful! I’m pretty new to essential oils and I wanted to make a chest rub for my kids. The base is made up of coconut oil, shea butter and beeswax and once melted yields 4oz. What’s a safe dilution/drops of sniffle stopper to use for kids ages 5-7? Thanks for always going the extra step to help your customers make the most out of every purchase! No more guess work. I will be referring back to this one OFTEN! Thank you for sharing great reliable info! So, to make sure I understand, if I want to make a blend for my face in a 10ml roller, I should add three drops of EO and then top off with carrier? While I’m awaiting a response, here’s my second question. Are body butters known as carrier oils as well? I ask that because if I’m using them in combination with an actual carrier oil, how do I know how much of a dilution i’m using? Hypothetically speaking, if I’m using 2 tbsp of almond oil and mixing it with let’s say 1/4 cup of cocoa butter, how much would that be in total for me to figure out how many drops of EO to use? If I wanted to add another butter, how do I figure it out then? I hope I’m not confusing anyone. I appreciate any information. Hello, I’m fairly new to this and am so anxious to begin coming up with my own blends instead of always having to look up recipes on the site. But it’s very useful for beginners so I can’t complain. I still seem to be stuck on 2 things. First, I’d like to make a 10ml roller bottle blend for my son who has ADHD, so he needs serious redirection in school along with other stuff related to the disorder. Now I know that I would use 6 drops total for the 10ml bottle. Here’s where the confusion comes in. If I were to use 2 or 3 different oils, how do I know how many drops of each oil to use? This would also apply to other blends I would like to make in general. Sometimes I see blends that say use equal parts and sometimes they’re all different amounts. I even tried going the 3,2,1 route with Top, Middle, and Base notes. It’s really confusing and I hope someone can make it simpler to understand. Thanks for all the great information. I like to mix about 5 different essential oils together with a carrier oil. If the chart says 10 drops of essential oil should I put 10 drops of each or is 10 the total amount for all the essential oils combined? Belinda, 10 drops would mean a total amount. Great question! This is just what I’ve been looking for. Thank you for the great information. 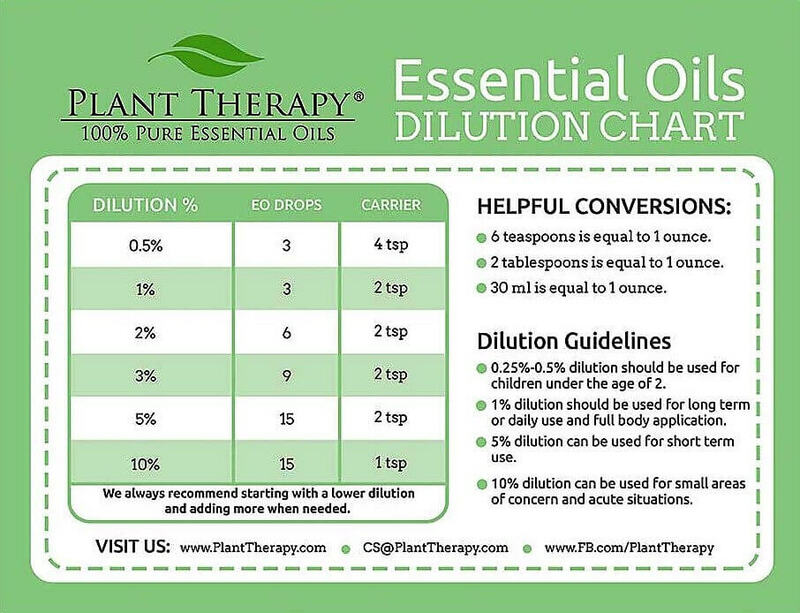 This dilution chart has been so helpful! Thank you for the informative article and the chart. Thank you for taking the guess work out of dilution. Before I found PT I had read many books, blogs, and never clearly understood what the % meant when it came to drops. I was always using an online conversion sight. You have made it so much easier! I think the answer will be yes, of course. But, just out of interest, should I make all the tools and containers (using during dilute processing) supposed to sterilised ? I discovered you one month ago and already placed two orders. Can’t wait fot the oils to arrive in Romania. Your site is an universe. I very much apreciate you because this is not just an e-commerce store, it’s a “classroom” where anybody can learn about this amazing domain of pure essentials. Thank you! I am reading about it every day. Very informative. But I have a question. If you are using more than one essential oil in a dilution do the essential oils count as a carrier oil for the other essential oils in the blend? Great article! I re-read this post a few times just to give myself a refresher. Also, shared this many times with family and friends. Thanks again PT! This may be a silly question, or please direct me to the location of this information: what does one use for the dilution? Your hand? A small container? Is that what the empty, amber bottles you can purchase used for? I’m fairly new to all of this! Thanks! Thank you so much for this information! It’s super helpful. Thank you. I love PT’s commitment to safety and education. Before OT I had been using essential oils for many years and sometimes not safely. I had done quite a bit of reading and research but I was never aware of sensitization and that is so beyond important! Essential oils are a great compliment to health but need to be treated with respect for the potent gift they are! This post is wonderful. I’m so happy that PT promotes safe dilution rate. So many other oil companies don’t, they just care about sale. this is great information, especially for those starting out with EO’s. Very comprehensive. I am very impressed with all the information in this page alone! It sure helps me to make diluted essential oil properly! Thank you PT! This is such great information. With a 4 month old at home this helps put me at ease! Thank you! The dilution charts are extremely helpful! Thank you for this post! I was unsure how to make rollers and dilutions for kids and this chart helps so much!! Great information about dilution. As a beginner I was nervous about using the oils on my children. This blog decreased my apprehension. Thanks for this information! I’m new to essential oils and was nervous about dilution, so I ordered roll-ons for my first batch. Once I feel a little more comfortable with their use, I will definitely be referencing this page. Thanks for this. I have been mostly diffusing and using inhalers, but I’d like to start making applying topically and I was very confused as to how to use the carrier oils with them. So this helps a lot. Thank you! 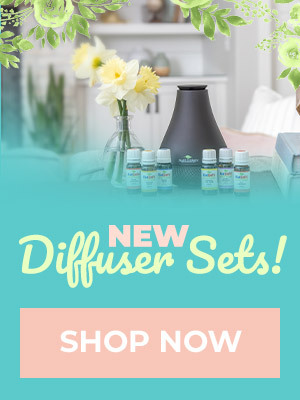 I am very new to essential oils as I just placed my order today and I can’t wait for them to arrive and being able to start using them. This chart will help a lot. Rebecca, we are so excited for you to start your oily journey with us! Thanks for such a comprehensive article! I’m happy to have good articles to refer my friends to, so they can learn as well! Nora, this is an excellent question! So, when referring to using undiluted, we are referring to topical use, not about use for inhalers, or diffusion. When applying oils topically we recommend diluting with a carrier oil. This was so informative, especially since i have a 2 year old. Thanks for the information. Thank-you for this information on diluting. I am new to essential oils and was not clear at all as to what to do with them, especially for applying topically. You’re welcome Jayne! Please feel free to reach out to our Customer Service team if you ever need assistance with the dilution process. I love rollerball application and knowing exactly how much to use based on which oil is very helpful. Thank you for the detailed explanation. As someone who uses essential oils for a little and myself, thus is not only extremely helpful, but also a great guide to share with others. Friends and family ask about oils and I love sharing safe information to help get them started. Dilution is such an important factor when using Essential Oils. We’re happy to provide this kind of information to help ensure our customers are using oils safely. Thank you for sharing with friends and family! We are are a brand new retail store opening in Oklahoma. Although we have been using essential oils for years, the information and education that Plant Therapy provides is invaluable when helping educate customers and actually being able to give them a printed copy to take home is so very important for many reasons. Thank you Plant Therapy for all that you do. You make it easier for us to educate and keep our customers safe, happy, and coming back. Excellent information! Thank you PT for always keeping safety a top priority! Thanks for this blog post. I just forwarded this to a friend who told me that she was taught by a MLM seller of essential oils to put one drop of Peppermint essential oil under her tongue every morning or everytime she needs to stay alert!! One question:may I know how many ml there are in one teaspoon and one tablespoon? Kiana, Thank you! I copied this information down on my notebook just now. Thank you so much for this & I am gonna print this out because I have see so many others using another brand of essential oils & putting them on your skin & the skin of kids without diluting them!!! That is not a good idea & I am very thankful that you have this explained so well. Nicole that is an excellent idea! We love to share information on how to safely use essential oils for adults and children 🙂 Hope you have a great weekend! Hi! Thanks for this detailed information which is useful for beginner like me. Quick question – so basis above, for a 3 month old, is it 3-9 drops in a 10ml bottle for spot usage? Tia! You’re very welcome Ida! It’s very useful information and something that is referenced often in the world of Oils 🙂 You are correct with your spot treatment dilution. 3-9 drops for 10ml bottle for a 3 month old. Thank you so much for this blog post! I found it incredibly helpful and had no idea I’d been using oils wrong the whole time. I copied the chart onto an index card and taped into my box of oils for a quick reference…which I’ve already used multiple times this week. Thank you for such a good load of info! So glad I found you guys early on in my oily journey – the only oil I ever applied neat was peppermint when I had a migraine a few times but SO glad I quickly learned from this company the proper way to help ourselves with oils through proper dilution!! Great information as always! I thought the discussion on dilution rates and when to use them was particularly useful. Great information!! Thank you for the charts! Being relatively new to essential oils this infirmation was very valuable, thank you. Great info on dilution! Thanks for posting! Unfortunately the MLM companies are constantly telling people to use most of their oils “Neat”. I had to learn the hard way with a rash on my chest after using neat. Helpful Info but I would also like to see safety guidelines for diffusing. I have the large diffuser and often think I may be adding too many drops to the water. Thank you for this guide i have been wondering how to safely dilute! And the charts are super handy!! Great post! I am wondering if you could please do a post and share for us which E.O to use on specific bug bites; mosquito, wasp, yellow jacket, etc. Thank you so very much for this wonderful information. Will be printing and adding to my EO education binder. This really helped me in deciding what and how much to use with my 3yr old. So now we will have separate roll-ons. Thanks so much!!! I always keep copies of my charts with me as a guide when using oils. Thank you for this comprehensive article and always putting safety first. So many people use essential oils in an unsafe manner and it baffles me. Thank you for the useful information and for helping people stay safe!! Thanks for the post! This information is very useful as I have been using my oils I’m roller balls. 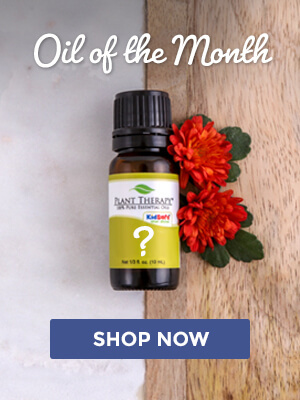 Does anyone have recommendations for which carrier oil they prefer? Wonderful information! Now I don’t have to guess at dilution rates. Thank you! The charts are fantastic! Wow, this is great information! And so easy to understand! Thank you! I love the chart graphics, too! This blog is CHOCK FULL of great info! Thanks for my dilution chart that I keep on my fridge. I’ve been using oils for a year and a half but just recently going beyond diffusing.This entire blog might be worth printing out, it’s excellent and I need to read it frequently to get it in my head for keeps! Very informative!! Thank you for making safety a priority! this is awesome! the only thing that would be even more helpful is to have an explicit chart for number of drops and dilution rates to different size roller bottles. speaking of, is plant therapy ever going to sell their own empty roller balls? i’d buy those in a second! Very handy to have taped inside of the cabinet door for quick reference. Thank you plant therapy for sharing this. Very helpful information especially to those who are starting on their oil journey. Thank you thank you for the dilution charts! I saved them both to my Pinterest. Thank you for posting this! Such needed information. Oils are so powerful and require carefulness to use them in a safe way. Thank you for posting this and explaining when each dilution rate is important! I like that both kid an adult information is all in one place! Consider this blog bookmarked!!!! Very informative! Love the dilution sheets and explanation. Perfect and informative, cannot forget the 1 drop per teaspoon for a 1% dilution which makes it easy to recall when mixing my oils at the 1% rate. Saved and keeping on hand. I love these charts! So helpful. Thank you PT for the excellent conversion charts and explanation. I always keep these handy! This blog is really helpful. I am new to essential oils and been eager to research about it for a few months. Finally, ordered my 1st set yesterday. I am so excited to receive my orders. This blog will indeed going to be my guide. Hoping to enjoy my oily journey. Do you recommend specific carrier oils for specific essential oils or will any carrier oil do? Great info. Your charts are wonderful as well. So helpful when making products. Thanks PT! Yes, Yes and more Yes! I love this post. I love the infographics and all of the information contained in the blog. I love how PT makes sure everyone is as safe as possible when it comes to using essential oils! When I mistakenly get straight up oil on myself (hand, fingers, etc) is it best to rub the area with a carrier oil? I’ve done this before and it seemed to help but what would be the best carrier to use in this situation? Great information for a beginner! I’ve heard that straight oils should not be stored in plastic. Is the same true for diluted oils? Can I put a few drops of oils in my shampoo and leave it in the shampoo bottle? Rachel, if you are planning to add EOs to a plastic bottle, I would recommend ones that are PET plastic. However, I have used oils in low amounts (.5-1% dilution) in my shampoo bottles, and they have been fine. This information is SUPER helpful! I have just been guessing at the dilution ratios, but I’m going to print this info so I can have it handy whenever I’m diluting them. Thank you! Great information. I’m new to oils, so I’m learning every day! Thanks for this post! I’ve often heard and read about dilution, but wasn’t really sure how to do it correctly. I look forward to making dilutions in the future!